Did you know that Ziploc bags are awesome? You did? Good. I was just checking. Because if you didn’t know that Ziploc bags were awesome then we were going to have to have a little chat. Those are my adorable kids pictured above, by the way. 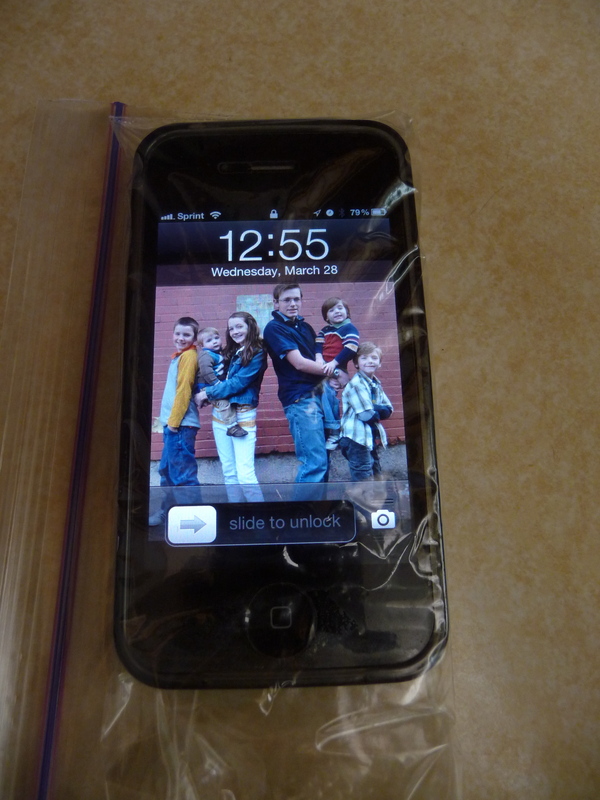 So, why is my iPhone in a plastic bag? I was patching walls, sanding walls, and painting walls. I receive a lot of phone calls. And I usually receive them when my hands are dirty. It’s just one of those Murphy’s Laws kind of things. I didn’t want to get my phone dirty or damage it by dripping paint on it or getting dust in the tiny crevices, so I put it in the bag. And lo and behold! I didn’t expect it to respond to my finger swipes and touches, but it did! I was very pleasantly surprised. So I left my phone out where I could easily answer a call with one finger while painting at the same time. It worked like a charm and all was right with the world. And if the bag got too dirty or covered in paint, I just changed the bag. And in case you were wondering, the bags don’t have to be the name brand Ziploc bags. You can use any plastic bag. I used the snack size and it fit my phone perfectly. I even tried using the freezer quality bags. They’re a little thicker and I thought they wouldn’t work as well, but they worked just fine. The next time you’re in the middle of a messy job (most home improvement projects, gardening, yard work, housecleaning, playing in the mud, etc. ), try this out with your cell phone and see how much easier it makes your life. Yep – Ziploc bags are the bomb. This entry was posted in Cleaning and tagged cleaning, gardening, housecleaning, iphone, painting, sanding, yardwork, ziploc bags. Bookmark the permalink. 3 Responses to did you know? LOL! Love it so much I pinned it. Great idea!